On our last trip to the "big" market, we bought a large jar of blackberries and, while I typically find the preserving liquid too sweet or the fruit too mushy in factory processed canned fruit, I was extremely impressed with both the quality and the flavour. These whole, firm berries, preserved in their own juice without added sweeteners were a surprise find indeed. After eating most of the berries with yogurt, the jar still remained half full of juice. Sloshing it down the sink seemed such a waste so I challenged myself to find something to do with it. After spending some time searching recipes online, I became inspired by a mishmash of possibilities and created a pretty incredible dish. So incredible, in fact, that I made it two days in a row. To begin, brew a half cup of strong black tea. Unlike the wine in last month's Drunken Applesauce, this tea is all for the recipe so, if you would like a cup to drink, be sure to brew more. Once your tea is steeped, remove the tea bag or tea leaves and add one half of a vegetable or chicken bouillon cube. Add one cup of blackberry juice and two tablespoons of balsamic vinegar. Stir and set this aside. 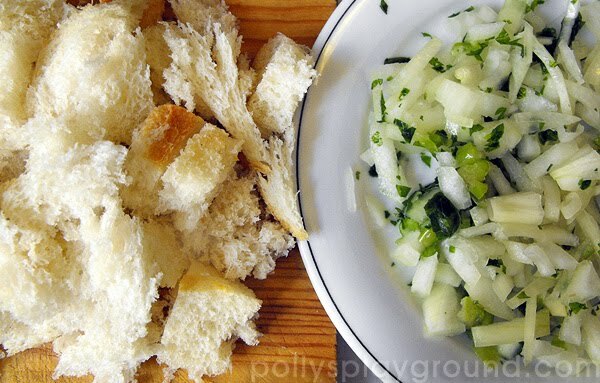 Next, finely dice one small onion (reserving half of it for later), a bit of celery and some fresh parsley; sauté in a small amount of butter until the onions are soft. Remove from heat and stir in some salt, pepper and poultry seasoning (I use Vegeta but I know this is not possible for everyone so the former will suffice). 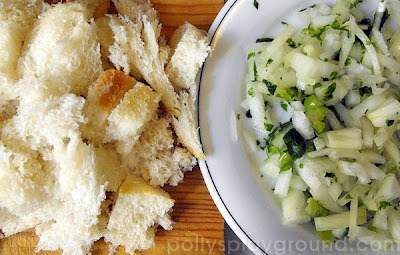 Toss in a good handful of torn up day old bread and stir to mix well. If the mixture seems a bit dry you can add a touch of water (or some of the juice as prepared above) but avoid making it too wet as it will end up very soggy after cooking. Making this two days in a row, mine was too moist on day one; I opted for more butter and no liquid on day two and it was perfect. Now take your boneless pork chops and pound them to make them fairly flat and thin. 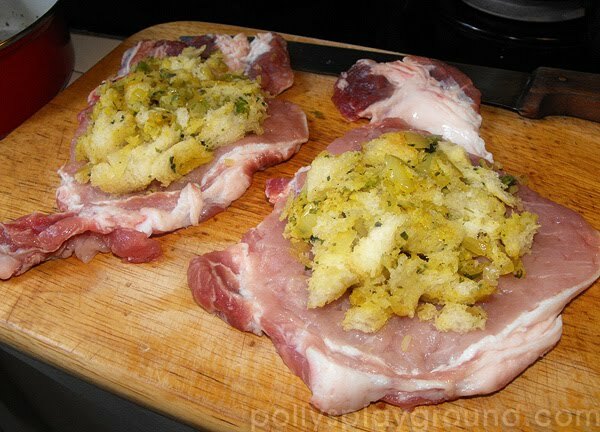 I just used two random pork chops and deboned them before hammering; they didn't look so pretty and were irregular in shape, but it didn't matter in the end. Divide your bread mixture to cover both flattened chops, then roll them up, tucking in the edges to make sure the stuffing stays inside. If your chops are very fatty around the edges they will curl some while they cook which might make them come a bit undone; you can tie them up with strings, but I don't like to mess with them afterward so I just don't bother. 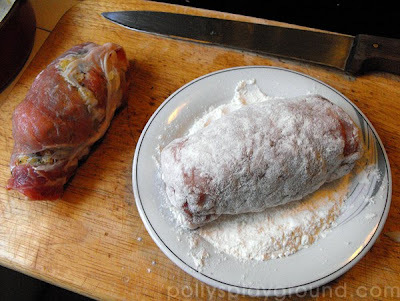 Once your little rolls are tightly packed and well formed, dredge them in flour and set aside. In the same saucepan that you used to make the stuffing mix, sauté the reserved half of the onion plus a teaspoon of thyme (I used dried - if you have fresh, adjust accordingly) in a small amount of fat (I used pork lard) - just enough to keep the onions and thyme from burning. Add your pork rolls and lightly brown on all sides; leave them seam side down and then add 1/3 of the the tea/juice mixture you have prepared. Stir around the pork to mix the juice with the onions, bring to a gentle boil, cover, reduce the heat to low and simmer for an hour. Once you put the lid on the pan, you have time to clean up your mess, peel potatoes and put them on to boil, fix your salad or prepare your vegetables. Every 15 minutes(ish) stir the sauce, lifting the pork to scrape any stuck bits off the bottom of the pan. Add a tiny bit more of your reserved juice to the pan, drizzling over the pork and bringing the sauce back up to a boil each time before replacing the lid. 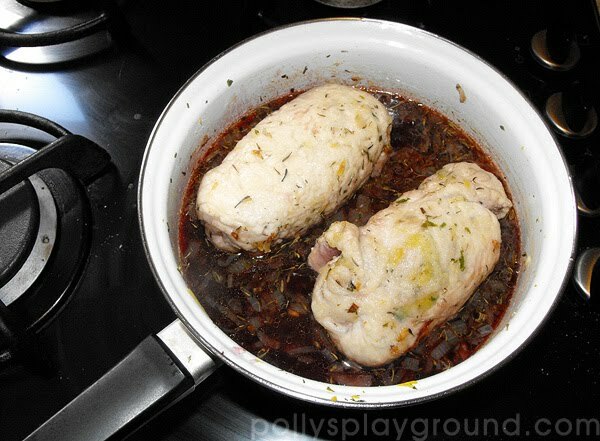 After an hour, remove the pork from the pan, place on a plate and cover with the lid to keep warm. Mix a tablespoon or two of flour (I just used the rest from the dredging) with an equal amount of the reserved juice and mix well. 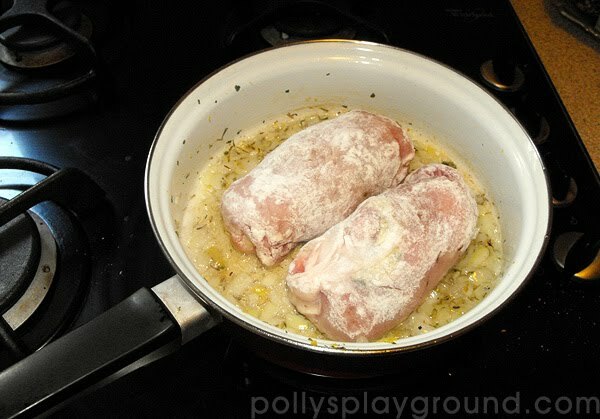 Slowly add your floury juice to the sauce in the pan, whisking constantly, to make the gravy. Add the remaining tea/juice and continue to stir, allowing it to boil for about five minutes to reduce and thicken (and cook away any raw pork 'ick' if you used the dredging flour like I did). 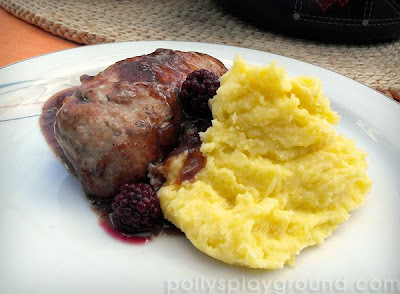 Remove from heat, stir in a few whole berries, return the pork to the pan and serve (alternatively you could arrange on plates or place in a proper serving dish - we aren't always so civilized). This very simple stove top meal will be on your table in just over an hour and the simmering time, which allows for full kitchen cleanup plus meal accompaniment preparation, is actually a time saving bonus. 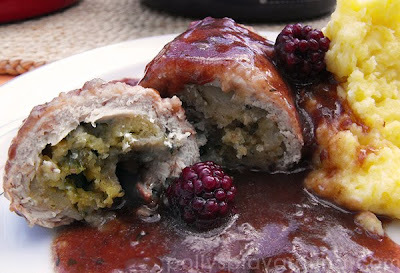 An easy way to make your everyday pork chop extraordinary, giving you plenty of time to relax and enjoy these individual tender braised pork rolls packed with fresh stuffing smothered in rich burgundy blackberry gravy. This looks yummy. I have about 1/2 cup of cranberries in the freezer and might try this with cranberry juice (not cocktail) because blackberry juice might be harder to come by. oooh that sounds great. let me know how it turns out. while we were eating this we talked about how good it would also be with plums. yes it would be really delicious with fresh picked berries. do it aicis!